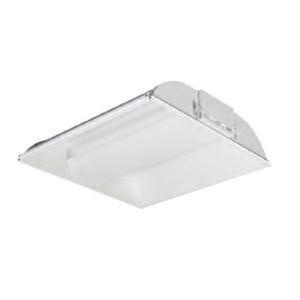 Philips Lighting Daybrite Collection Coffaire fluorescent recessed lighting fixture comes in direct/indirect lamp shield appearance. Perforated mesh lamp shield features white acrylic overlay. Lighting with contoured body and ends, has tension bars that secure ends to body. It features die-formed code gauge steel chassis parts for added durability. Lighting fixture fits flush to face of slot grid ceiling and the same fixture fits both G and T ceiling types. This static model has injection molded light stop at basket ends and perforated lamp shield hinges on either side.